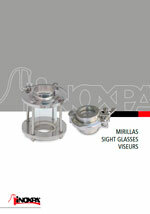 A clamp flat sight glass consists of a glass attached by means of a clamp. Sight glasses are fitted to tanks to inspect the product, level, course of the process, etc. 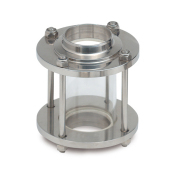 They are widely used in the food-processing, cosmetics, pharmaceutical and fine chemicals industries. Glass attached by a clamp. Gaskets: VMQ, NBR or FPM. Connections: Clamp, SMS, FIL-IDF, BS-RJT, flanges, etc. Borosilicate glass accroding to ISO 3585 and EN 1748 T1. 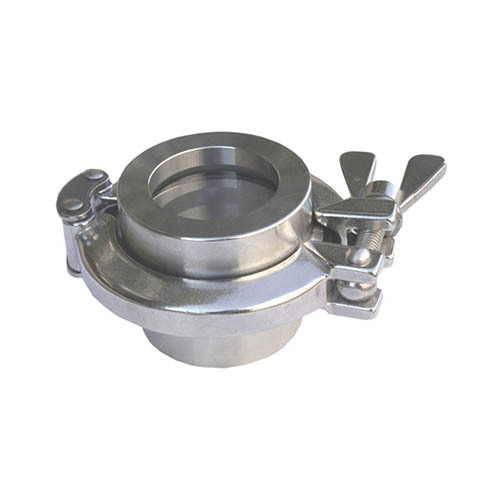 Double flat clamp sight glass. Summary Una mirilla plana clamp está compuesta por un vidrio fijado mediante una abrazadera clamp. Summary A clamp flat sight glass consists of a glass attached by means of a clamp. Summary Le viseur plat se compose d'un verre fixé par un collier clamp. Summary Плоские смотровые стёкла cостоят из стекла и крепления Clamp.